The US is releasing Crude Oil Inventories, ISM Non-Manufacturing PMI, Final Services PMI and ADP Non-Farm Employment Change but Japan is not publishing any economic reports. 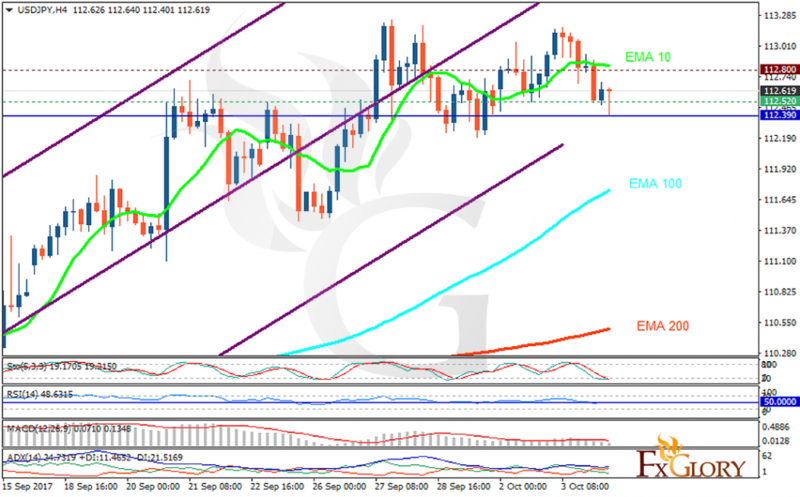 The support rests at 112.520 with resistance at 112.800 which both lines are above the weekly pivot point at 112.390. The EMA of 10 is moving with bullish bias in the ascendant channel and it is above the EMA of 100 and the EMA of 200. The RSI is moving horizontally on the 50 level, the Stochastic is moving in low ranges and the MACD indicator is in positive territory. The ADX is showing sell signals. Regardless of the pullbacks, USDJPY will continue its bullish trend towards 113.2.